Best jumper cables can make a difference between spending a night stuck on the road and getting boosted by another motorist. Even if you have a powerful battery, it’s humanly to have the best jumper cables by your side so you can help others. You don’t have to spend so much money on inferior cables that may not match your battery type or deteriorate quickly. Having gone through a plethora of jumper cables, I have compiled a list of the top 5 products. Also coming as a 25 feet booster cable, this product is long enough to accommodate cars that are not too close to each other. As I indicated already, it may not always be practical that the booster car is parked in front of the dead car. In such cases, a longer jumper cable is preferable. 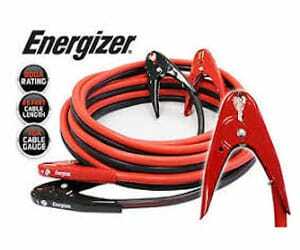 The Energizer Jumper Battery Cable can be a good fit. The jumper cables have a 1-gauge which guarantees thick wires that ensure a faster charging of the dead battery. Remember, the higher the number of the gauge is the thinner the wire and that will take time to jump-start the flat battery. With a 1-gauge booster cable it can take from little to no time to jump start it. The clamps are copper clad aluminum which presents an efficient mixture to conduct electricity and boost the flat battery. Aluminum is lightweight and less expensive, so this jumper cable will not be too heavy, although 25-feet reflect a bulky product. I wish the seller included the carry bag, but no it isn’t included. Either way, it’s worth investing in the Bucket Boss AB30070 Cable Bag as a front mesh bag and fully-zippered to secure your cables. Some cables are susceptible to low temperatures, but this one isn’t. Even at low temperatures as low as -40 degrees Celsius, it remains flexible.Again, it is tangle free, so you won’t have to spend more time in the rain trying to sort out the cables. The cables can be stored with ease in the car for ease of access in case of any emergency. The clamps are PVC-coated for an optimal insulation when working with the cables. Energizer is an international brand renowned for its quality batteries and other products. The company has surely invested more in the quality of these cables, which I would love to recommend for any motorist. It’s worth it to include it as your emergency kit. Twenty feet is long enough to even charge when the booster car is at the back. That’s a plus advantage. Other features are similar to my first product above. Included with the carry bag for storage convenience, this is a longer cable to jump start SUVs, motorcycles, vans, sedans, trucks, etc. It comes in handy when you stuck with a flat battery, so it can transfer power easily to the dead battery. It has a capacity of 800 amp and is a 1 gauge booster cable. These features assure a quick recharge of the dead battery. The lower the gauge is the more effective the wires. As in the name, EPAuto booster cable is heavy duty, meaning it can help lots of cars of different sizes. Whether you travel with a truck or a tractor, the cable can rescue you. Its 25 feet length is also convenient when jump-starting cars far apart. Remember in a real world it may not always be possible that the cars can be moved closer to one another, especially in emergency situations. The other might be packed at the back of the dead car, which then needs a long jumper cable to reach the posts of the dead battery. Coming in distinguishable black and red color, it makes it easy to identify the positive (red) from the negative (black) cable. This color feature comes in handy at night because then you won’t misconnect the terminals with wrong cables designated for other charges. The clamps are coated with a mixture of copper and aluminum for an optimal connectivity of electricity while the handles are shock-proof coated to protect you. What I find pleasing with these cables is that they are tangle free. The storage bag makes it even more convenient to avoid shrinkage or tangling. But the 11.3 pounds combined with 25 feet make the cable bulky. Be prepared to lift a heavy set. Nonetheless, since the cables are copper clad aluminum, they will not be that heavier compared to pure copper. A mix of aluminum and copper is still efficient in boosting empty batteries although not better than a pure solid copper. This set of cables is good for any motorist driving a variety of cars such as SUVs, vans, trucks, and sedans. I like its 25 feet length and 1 gauge which determine the thickness of the wire for faster jump-start. I would recommend the product to any motorist. Looking at its colors, it’s easy to spot the negative from the positive even in low-light conditions. That’s a convenience every wants rather than spending time trying to figure out which is negative/positive. Cartman Heavy Duty Booster Cables is also a premium brand of jumper cables with a capacity of 800 Amp suitable for heavy-duty vehicles. Although its clamp teeth are not large enough, it is still a good product to jump-start heavy duty vehicles. It boosts the flat battery faster at a switch of the dead car and the booster car, so I don’t see it slipping due to engine vibrations.The cables are versatile to fit on both side-mounted and top-mounted terminal posts. That’s the convenience we need in our cars. Just like the two aforementioned products, these cables are also copper clad aluminum, which is a good product following copper in conducting electricity. Its perks include a lightweight and affordable price than a pure copper. So you can save extra dollars you would spend in a pure copper. Made 25-feet long, the cables will be ideal to charge cars apart. You do not need to be a few inches apart. Even at the side or at the back the booster car can park while the booster cables connect the two batteries. Furthermore, the cables are 1-gauge, which signifies the thickness of the wire sufficient to boost the flat battery in a short period of time. To clear off the confusion, these cables are clearly distinguished with red and black color. Always note that red refers to positive and black to negative. And never let the cables of different charges touch each other to avoid sparks or even injuries. 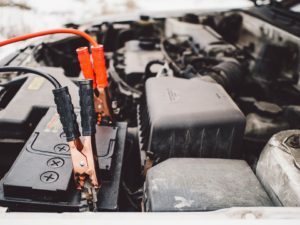 Follow the correct guidelines of jump-starting your car by connecting the positive first and then negative first starting with the dead battery. Remember, all cars must be switched off when connecting. Then start the booster after connecting, and then the flat battery car to jump-start. It should take a few minutes to achieve your mission. The cable is made with TPR material to make it last long. It is also temperature resistant up to –25 degrees Celsius. This is an added advantage because some batteries do not perform under such temperature conditions. Given any season, these cables can work perfectly. Copper coated aluminum not as good as pure copper in conducting electricity. Personally, I don’t see much of the difference between this product and the aforementioned ones. They all embrace 1-gauge and 25 feet length for more convenience.I still recommend this product. It is a good set of cables to rescue you or other motorists on the way. What I applaud is its versatility in many vehicles.The color variations make it easy for ease of identification that which charge is positive or negative. That’s a plus that adds to my recommendations. Fits top and side post batteries; Luxurious carry bag for free. Sufficient CCA (Copper coated Aluminium). Ideal for use with full size pickup trucks, large recreational vehicles and freight hauling vehicles. For 800Amp use. Over 50% greater conductor than of a 2 Gauge. Hoping to save a few dollars off your purchase? Why not try the ABN Jumper Cables? Unlike the above products I reviewed, these cables have a capacity of 600 Amp and 2-gauge. Obviously these are inferior to the above products, hence the lower price. However, they may not be as efficient as the others but are still handy for those who want to save more money. We must bear in mind these cables have a solid copper not a copper clad aluminum. The 2-gauge is a good thickness to still boost the battery in a short period of time than a 4-gauge or 6-gauge cable on the market. When picking these products, I endeavored to only consider the thick ones – that is the ones with less than 4-gauge. The higher the gauge is the more time it takes to boost the dead battery. That’s the inconvenience you can’t stand for as other motorists may be reluctant of helping you if the cables take ages to boost your dead battery. With the 25-feet, the cables can be useful to connect even when the other car is parked at the back. Regardless of this long-size, the cables are tangle free. You can store them in the included carry bag to access them when needed. Moreover, the color variations make it possible to avoid crossing the wires. The red denotes the positive while the black denotes the negative charge. It is important to connect the charges properly lest you expose yourself to danger. 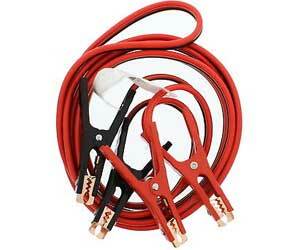 Design-wise, these ABN Jumper Cables have a non-slip rubber coating for a secure grip. During the downpour, it can be annoying when the cables slip through your hands because of a slippery design. Thanks to the rubber coat in these cables. Also worth noting are the high-tension parrot clamps and the serrated jaws to ensure that the cables hold tightly to the battery terminal. An engine vibration is not a match as it is often a case to weak clamps and teeth. The 600 Amp is still powerful for a variety of vehicles such as SUVs, trucks and vans. It is a commercial grade automobile booster cable which you can rely on for your battery emergencies. No matter the power of your battery, I guarantee you don’t have to travel without a set of cables because anything can happen. Imagine parking in the parking lot to go to shopping, and then come back to a dead battery. Or, imagine seeing someone stuck alongside the road because of a dead battery. These scenarios will encourage you to consider the booster cables, hence I picked this product. Although it seems inferior to other products because of the 600 Amp and 2-gauge, it is still an efficient product to have. Because of its solid copper, it can surpass the performance of the copper coated aluminum. So I still find this product effective to successfully boost a wide variety of cars. It is long enough to charge batteries far apart. I also applaud its non-slippery rubber coating which helps for a better grip. It’s a product I wouldn’t mind spending dollars on. 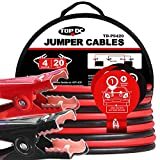 Always Prepared Jumper Cables is my last reviewed product on the list. The cables come with the carry bag so you can store them securely and conveniently without tangling. The other included accessory is the Emergency Auto Escape Tool. That’s an added advantage seldom found in other cables without the price being increased. These cables have a capacity of 400 Amp, which, when compared with the above products, lacks behind and may discourage others. Nonetheless, it is still a good product to consider if you don’t want to break your bank balance. The thickness of the wires is measured by the 4-gauge, which is also a great feature to transfer power relatively faster. 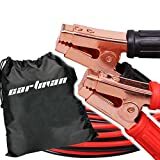 From the minimum of 15 feet required jumper cables, these ones are 5 feet extra to make sure you recharge even at the side or back of the dead car. So, 20 feet is an ideal length of cables. It is a long product but immune to tangling because of its rubber design. You do not have to spend more time in harsh weather trying to sort out the cables. The alligator clamps are easy to open and the clip securely on the battery terminal. Some clamps get disconnected from the terminals when the engine vibrates; it’s not the case with these ones. They grip viciously to the posts. When opening the clamps, you simply squeeze them and then release when connecting to the battery terminal posts. These cables weigh just 4.5 pounds, which is lightweight to walk around with. The manufacturer has included the 10-year warranty with these cables. You’re sorted for the next 10 years since you can replace the cables every time they get faulty. Anyone can operate these cables with the user manual provided. Here’s a compact and lightweight product I would recommend to anyone wanting to save some dollars in the purchase. If you are more into advanced and more powerful cables, I will not recommend these cables. To me they seem standard, yet still impressively good with a 4-gauge and 600 Amp. The length is 5 feet less than the other products I’ve reviewed above. Nonetheless, it’s a good product, which even a newbie can master with ease since the instructions manual is provided. 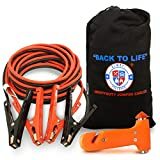 LIFE-SAVING BOOSTER CABLES - With a 400 AMP capacity, these insulated 4g jumper cables will quickly bring your vehicle's battery back to life again in all seasons and weather conditions. POWERFUL & RELIABLE - Our alligator jumper cable clamps open wide to securely clamp around any battery connection. With a 20-foot reach, you can easily connect to another vehicle's battery without worrying about space or size. 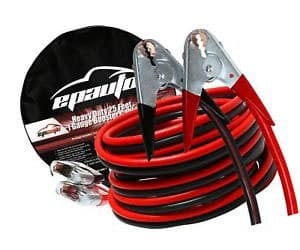 GIFT FOR FIRST-TIME CAR OWNERS - The ideal gift for anyone in search of a new car, our car jumper cables kit is perfect for young drivers, those buying a used or new car, and those wanting a little extra piece of safety and security in their vehicles. 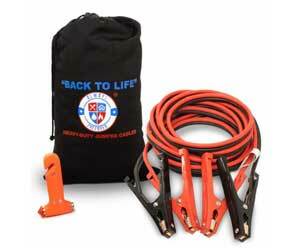 CONVENIENT & PORTABLE - Our sturdy carry bag ensures your jumper cable is free from damages or knots. Lightweight and compact, you can securely store your cable in your vehicle's trunk, backseat, or spare tire compartment. 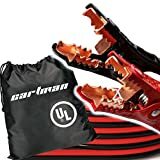 EXCLUSIVE BONUS ITEM - This car emergency kit also comes with an exclusive hammer tool that can make all the difference in an automobile or truck emergency. Store it under your seat or in your main console where you can use it to quickly cut a seatbelt or break a window. What is the best jumper cable? What does AMP mean for jumper cables? How many AMP do you need? Are booster cables and jumper cables the same thing? Which terminal do you hook up first on a car battery? 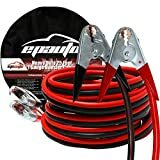 What to look for when purchasing the jumper cables? To purchase the best jumper cables is not as easy as one think. Some actually disregard the basic principles and decide to buy these cables but then later regret their purchases. Like any other product, cables need careful attention with regard to their gauge, size, length and other features. Contrast to popular belief, price is not a clear indicator of the best booster cable. I’ve compiled this buyer’s guide to introduce some concepts to help you make your purchases. 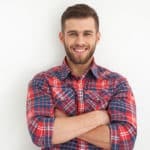 Before making any purchase, you would want to know what the best jumper cable is and what makes it the best in the market. Normally, the standard cable has a gauge rating of 6. This rating indicates the thickness of the wires which is, in turn, the potential to jump-start the flat batteries faster. A lower gauge, say 1-gauge as some of the products above, indicate that the cables are thick enough for a faster boost. 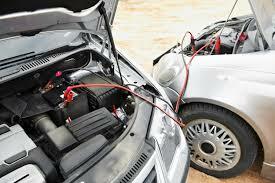 Some jumper cables can have a rating of 8, which is not necessarily bad, but can jump start most of the vehicles. So, whenever making a purchase, check the gauge to see if it is satisfactory. The higher gauge indicates a thinner wire, which is of course lightweight but takes long to complete the process. The answer can be subjective and dependent on many factors. But, in reality, emergencies can surprise you whereby you are unable to drive the booster vehicle to the front of the dead car. So if you have a shorter cable in that regard, you’ve failed. At times the car may need to be parked at the rear end whereby you need a longer cable. Typically, 15 feet cables are the minimum required. It’s a plus to get cables longer than 20 feet as in my reviews above. With 25 feet you can literally jump start with the booster car parked at the side or at the back. AMP refers to the amount of current transferred from the good battery to the dead battery. These figures are seen as 600 Amp, 800 Amp, and 400 Amp for each jumper cable. They somehow correlate with the gauge of the cables. For instance, cables with 1-gauge transfer more amps to the dead battery than the cables with 6-gauge. That is, a thin wire, 6-gauge, transfers less current than the thicker one. It’s also important to note the AMP ratings before making a purchase. With low ratings you may have to spend some time before your dead battery gets boosted, whereas with sufficiently high AMP rating it can be boosted. As explained above, it depends on your preference and your budget. The higher AMP rating will help boost the dead battery faster, whereas the low rating will take time. On average, cables have ratings of between 400-600 Amp. If you get ratings over 600 Amp then you found a high-performing set of cables. The higher the AMP rating is the higher the price. This is a question I have seen been asked by many motorists. It is true though that one seldom make efforts to learn about using the jumper cables until that time comes that they need jumper cables. Once you realize that you have a dead battery, look for your jumper cables and put them nearby. Then look for the car with a good battery that can help you jump start your battery. Many motorists are friendly, so you may not take time until someone comes to your rescue. Let the other motorist park his car adjacent to yours in a closer distance in relation to the length of your car. That’s where the length comes in handy. A 25 feet cable can be used even the cars are not too closer to each other. Important: the cars should not touch each other. Both the engines must be turned off before connecting the terminals. Clamp the positive cable, the red one, to the positive terminal of the dead car and also on the good battery in this order. If your battery isn’t clearly marked with red and black, look for the + sign. Clamp the negative cable, black, to a bare space on the engine. This can be the bolt or the screw, not directly on the battery terminal of the dead battery. On the other side, clamp the negative on the negative terminal of the good battery. 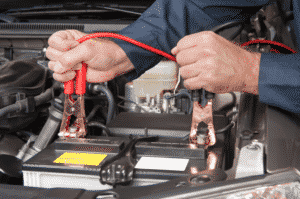 Before you can start the engines, make sure these jumper cables are not touching each other. Start with the good battery car to switch on the engine and wait for a few minutes before you can follow with the dead battery. Then start the dead battery car and wait until it gets boosted. Once boosted, remove the cables from the terminals successively. Start with the negative cable and disconnect from both cars. You should be sorted after this step. 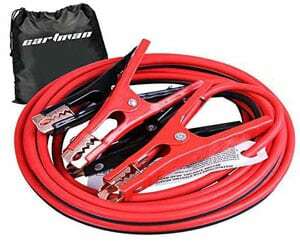 The phrase booster cables is often used interchangeably with the jumper cables. 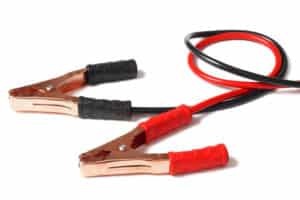 They are a pair of wires that differ in thickness from one product to another with the clips at each end to connect one battery to the other. The process is explained fully above, but, in a nutshell, you must connect the red cable to the positive terminal of the dead battery. The red cable is the positive one. Then connect the other end of the red cable to the booster battery of the other car. The next step is to connect the black cable, negative one, to the negative terminal of the good battery, and then connect it on any metal part of the dead battery. It could be the nuts or bold. You should start with the positive terminal, which is the black one, of the dead battery and then that of the good battery. The negative will follow. When removing, start with the negative terminal. Now this is a major concern of every motorist that what to look for when purchasing the booster cables. It is quite appalling to find out that other motorists disregard the important factors needed to choose these cables, but later regret their purchases. 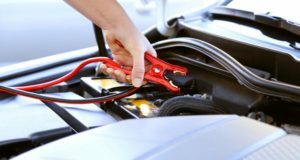 Jumper cables are seldom used daily, so it can be tempting to just buy any product and store it until the day you need it. Like any other product, you should take into account different aspects when shopping for these cables. These include the length, the wire gauge, and the type of clamps, the insulation and lastly the price. Wire gauge – The wire gauge helps us assess the quality of the jumper cables. It relates to the thickness of the wires and it is denoted with numbers. A 2-gauge is thicker than a 6-gauge, so do not deceived by big numbers. Again, the wire gauge also indicates the ability of the jumper cables to transfer current faster. A thin wire, for example, will take time to boost the dead battery whereas a thick wire will do that in a few minutes to no time. Type of clamps/cables – Usually, a solid; pure copper is used as the best conductor of electricity. In other cables, it can be a composite of copper and aluminum, or steel. In the products I reviewed, there are copper clad aluminum cables and solid copper ones. The solid is much better than the copper clad aluminum. Aluminum is added for its lightweight and affordability. Furthermore on the clamps, you should consider the teeth of the clamps. They should be able to grip on the battery terminal securely. Rubberized clamps are comfortable to use as they help in shock prevention. That’s another feature to consider. Length of the cables – the length is an important feature as well. In real life scenarios or emergencies, you may not always be able to park the cars too close to each other. In some cases you might have to park at the back or side. A short cable is bad news. On average, cables should be over 15 feet so you can use them with flexibility. All the products I handpicked are over 20 feet long; that’s a plus advantage. Insulation – Well-insulated cables will not expose you to the heat that passes through the wires. Have a look at the extent of insulation of the cables before making a purchase. Other brands include the hand gloves to enhance insulation when working with the cables. Heavy-duty insulation is a must-have because of the amount of heat involved. Price – This is not necessarily a factor but a warning to those who base decisions solely on the price. The price is, of course, an important consideration so you don’t break your bank. At the same time, it can mislead you or prompt a purchase of inferior quality. Jumper cables are essentials, so they are worth an investment. The price should only be factored when comparing same brands with seemingly same quality inherent in them. There should not be any excuse to have jumper cables. Even if it’s not you, other motorists might need help on the way. These are the essential tools every motorist should have stored in the car. Some come with carrier bag so you can store with ease. 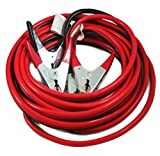 The best jumper cables come in different sizes as determined by the length as well as the wire gauge.